Later in this page, the reader can read in detail about each facet mentioned above. Getting into the music business can have different approaches, depending on what area we choose; for example, do we want to be a sound-engineer (live gigs), or a recording sound-engineer (studio projects), or do we wish to be an artist. Or do we wish to be a backing musician (as part of a band) or a backing artist as a chorus singer, or a lead-singer, as in a “pop-star”. It stands one in good stead to have a formal musical education, true of any discipline one intends to become active in. However, in the music business it is not a necessity. It is one of the few industries in which one can hit the jackpot and become a millionaire within a short space of time, without having a scrap of education. This is why so many widely-divergent individuals are in it; people of high class, low class, rich, poor and everything in-between. For now, we will only handle the question of how to get into the record industry if you intend to be a singer. Although artists can be discovered by talent scouts, this method is largely dead. You are more likely to be discovered in a singing or talent competition. Or a Record Producer could discover you in a karaoke joint… both scenarios not very likely. The most popular method has become to get a demo together, and then taking it around to record companies. If they like what they hear, they will invariably call you back with a recording contract offer. Getting a demo together entails finding (preferably original) material to record. Next, you have to arrange to have the music track performed. Lastly, you have to find a recording studio to lay it all down. Years ago, this was a daunting task, which is why it was not very common. In the old days, one had to find musicians who would do the playing for you of all the chosen instruments in the song; indeed a very difficult task. Next, one would hire a recording studio. But unlike today, recording studio rates in the old days were prohibitively high. Technology today however, has made things much easier, and therefore cheaper. Work out a budget, then get your money together… a good recording-project is by no means cheap. Cheap recordings do exist, but one can always hear the cheapness in the poor quality of the recording. Once you’ve found what you believe to be the right studio, book your session. An important note is that if you believe it should take 4 hours to complete your demo, then take 5 or 6 hours worth of money, because almost always, the allotted time is overshot, then you have to leave the studio without a completed project… a real disappointment. Continue with this procedure, doing your songs one by one, until you have at least 4 songs. Only after this, should you make a few copies and drop them off with various record companies. The Demo Delivery: How you package your demo is extremely important. Demos which have been thrown together without fore-thought and insight, are disregarded by record execs. On the other hand, demos which have been well-packaged, attract attention, because it tells the execs that this is an individual who is serious about the business. No one, in any industry, has time for jokers. The best way to package a demo is to include a good photo of yourself, with a brief but meaty biography, plus complete contact details. There is nothing so frustrating as a demo which attracted interest, then there are insufficient or no contact details in the package… something which happens all too regularly. Bad packaging can cause you to lose out on any possible contract offers. What happens when nothing develops from your demo delivery? This is one of the most difficult situations for the novice singer to handle. They start to believe that they have nothing to offer the world, they are not good enough, they sing badly, write no-good songs, etc. etc. All of these beliefs are probably furthest away from the truth. The first thing you should realize as an aspirant singing star, is that record execs almost everywhere in the world, are very limited on general capability, whether it be in marketing, promotions or music art. They tend to be scared of developing new product, scared to take a chance on new directions, or else incapable of seeing through whatever risk they did decide to take. Generally, they’re all looking for that product that will just walk it’s self up the world charts, without requiring any input from their side. In my life-time of being in the music-world, I have met some South African record execs that made me wonder in disbelief how they ever got picked for the job! But if you can come to terms with this fact of musical life, you have achieved some success in your quest. The next thing to remember is that it should never be purely about money. If it is, the first sign you see of non-success will make you withdraw from the music business faster than one can say “I’m a Pop-Star! !” This could mean a loss to the world of an artist who is possibly truly talented. It should first & foremost be about your passion for the art. The people who manage to become a success in this business are the people who persevered forever, and then some. This kind of success can only be ensured by having the passion for the thing. There are other avenues; Years ago there was only one option for getting your music to the world; record companies. However, today we have the Internet and Broadband connections, which can stream/download content fast enough. The Internet has spawned Internet music distributors, like OD2. There are many Internet companies like this one, who will sign individual artists up for distribution. These companies, using this system, are becoming so popular that they pose a serious threat to the long-term survival of traditional record companies. This is the reason why some traditional record companies are now starting up Internet divisions themselves. That it has taken them this long to jump on the band-wagon, is a serious indictment against them, confirming what was mentioned previously in this write-up. What ever may happen after your demo delivery, keep your passion alive, and don’t stop the music! It has taken me 25 years to finally be able to do what I love most in life, and make a living from it. If I had given up after the first negative sign (of which there have been hundreds), I would not be able to enjoy the fruits of my musical success, and my soul would be the worse off for it. A properly organized record company is an organization that sells recorded music by various artists who are contracted exclusively to them. They normally provide the finance required to get the songs recorded, printed, packaged, distributed & promoted. In order to do this, they ideally have their own retail outlets, through which they would sell their product. However, the norm is to have a sales agreement with a CD retail company who has these outlets. This retail company will receive product for sale from many different record companies. The record company will also ideally have it’s own promotions /marketing/ advertising division. (See Promotions Function below). Owning a division like this is also not a necessity… this function, like the retail outlets required, can be outsourced. The record company also has warehousing facilities, together with a data-base system to track movement of all it’s products. Promotions Function: Once an artist has released a record, it may be the best work of music-art in the world at the time, but it would get no-where without promotion. Most record companies have their own promotions/advertising division. It is this division’s responsibility to ensure the newly-released product becomes known to the territory where it is released. If no-one knows about a new product, it will of course never sell any units. Unfortunately, record companies are choosy, and in many instances ineffective when it comes to promoting their product. Some record companies release hundreds of new product per year, but choose only a handful to promote, and then most of the chosen few are not promoted well at all. Projected potential earnings of the product will determine the size of the advertising budget allocated to the product. Size of budget will determine how much promotion the product gets. Due to many factors, projections are often wrong, causing a perfectly viable product to fail in the market. A second tier of the promotions function is largely carried out by the Artist in conjunction with the Promotions division. This entails the Artist making personal appearances at market places like CD retail outlets, giving TV interviews and live-performances. All of these activities combine to disseminate the information to the potential buyer that Artist X has just released a new product, who Artist X is, and what the product is all about. If all the above are effectively co-ordinated, the Artist will have a strong chance of success in the market, provided his/her product has reasonable appeal to a sizeable section of the population. These are the people who come up with the beautiful (and sometimes not so beautiful) songs that we as the listener eventually get to hear. Precious few songwriters are sufficiently gifted in being able to compose a great song, and able to sing it damn well at the same time. In many instances where this is the case, it becomes confusing to this type of individual; they are not sure whether they are a singer or a songwriter. There is no problem in being both, as long as one can understand the ramifications that come with it. It is however important to note that both these arts are highly specialized fields. I have met many aspirant pop-stars, who were great singers, and insisted on writing their own songs, but sucked at it. On the other hand, I have also met many a promising songwriter, who insisted on singing their own songs, but sucked at that. The first thing to learn about songwriting, is that in your mind you have to accept that first & foremost, this is what you are. If you have this down, then you will understand that songwriters are the ones who produce the music that generally someone else will eventually sing to the world. A functionally correct team is a good singer, who sings a good songwriter’s song. If this tried & tested rule is not observed, the good songwriter will attempt to sing his song with his bad singing capability, and/or the good singer will sing his own bad composition… a recipe for guaranteed failure of the song. Assuming that you are a songwriter, you will need to find a good singer and a reasonable studio, to lay your compositions down so that you have something on disc to demo to publishing houses (or established singers, if you’re lucky enough to have access to them). Getting to both these entities are necessary for you to become known as a songwriter. Copyright: Every piece that you create, should be written down. In the old days, a newly created piece would be musically scribed, that is, notated in musical form. This entails writing down the melody on a music staff, and then pinning the matching lyric to the respective notes. This is a cumbersome procedure if one does not have formal music training. But in today’s simpler life of high technology, you just need to record your song and bump it down on a CD, which should be closed permanently after writing, so that no further writing can take place. During the CD-writing process, the file will be date-stamped. Next, you should register the song with your country’s recognized copyright society. (In RSA this is SAMRO http://www.samro.org.za, in the US it’s BMI and ASCAP, in Germany it’s GEMA). If for some reason you cannot or don’t want to register with a copyright society but still desire to be copyright protected, you can go to your local bank and hire a safe-deposit-box. All items lodged here are also date-stamped. It is in your favor to note the importance of registering with your copyright society. If you do not do this, an honest someone could discover your song, use it in a TV series or film, correctly notify the respective society, but you will get no payment for the use of this piece, because the society does not have any record/details of you. These are the people who will take a completed song, in rough or semi-arranged state, and do an arrangement of your song. In this process, the Arranger will decide what instrumentation to use, and how and what accompaniment those chosen instruments will play. If required, he may also have to musically notate the arrangement of each instrument, so that a band/orchestra can play it by reading the arrangement by sight… this eliminates long and costly rehearsal times. Although we have a 21st century trend called “convergence”, meaning more and more the various disciplines are becoming blurred because the songwriter these days can also be the Arranger, Singer, Producer etc., make no mistake, Arranging, like Producing or Songwriting, is a highly specialized field. It can make the difference that a good song is accepted or rejected by the masses. In the music world, this term has to be understood properly, because in the film/tv world, it means something entirely different. In the latter, a producer is the person who will go out to find the money to do the project. They most of the time have nothing to do with the creative side, which is left to the Director of the project. In the music world, the Producer does what the Film-Director does… he directs the artist’s performance, controls & manages the project, and mixes the finished product. Most Record Producers tend to also be the composer of the song the Artist is singing. Of course, this requires naturally of the Producer that he/she be well versed/experienced in all the necessary fields which will be required to produce the song. Thus the good Record Producer should have an extreme ability and knowledge of singing, instruments and the way in which they behave, genre’s, sound-engineering and human relations, to mention just a few. These are the facilities which will record any sound projects. These may be jingles, voice-overs or music. The recording function is normally all that they will perform. 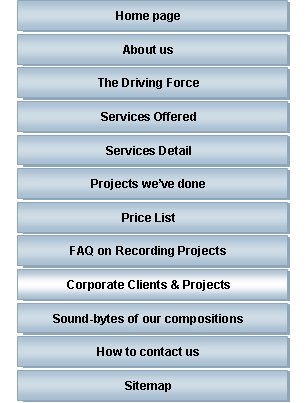 For this they need, as an integral facet of their existence, a sound-engineer, and various items of equipment, like a recording console, sound recording units (digital or tape based), various items of outboard gear like sound processors, compressors synthesizers, and of course, acoustically treated premises. The basic premise is that the creative team consisting of the Producer, Arranger, Songwriter, Singer, & backing band will book the studio to do their recording. These are also recording engineers, but concentrate on live sound… that is, live performances on stage. Live sound although similar in many aspects, is also different in many other aspects, because of the recording environment, and situation. In a studio recording, when something goes wrong, we can stop the procedure and check till we solve the problem. In a live situation, we can’t ask the audience to take a break while we try to sort out the bad sound they’re hearing. Physical differences involve the backline; what goes on on-stage. The band and singers have to have stage monitoring in order to hear themselves. This monitoring has different emphases of the various instruments on stage, so that what the bass guitarist hears in his monitor is not the same mix which the brass section would hear. This is necessary for the various players to produce their best. The type of monitoring is also vastly different in a studio where mostly earphones are used. Live-show microphones are also very different to the recording studio… they should be less sensitive & less prone to feed-back. The live-sound engineer should also take special note about mixing levels if he intends to record the show, because what he and the audience will be hearing, will not be exactly what will be captured in the recording. Answers & insight into the business, by Claude King. Before this question can be answered, you need to know a bit of background information .